“What happens to you when you become a little too successful” was Peter Gabriel’s explanation for Big Time. Or, I suppose, a comment on unchecked capitalism, consumerism and greed which is as potent today as it was 26 years ago. This cartoonish, brash song, always brings to mind ABC’s How to be a Zillionnaire (“I’ve seen the future. I can’t afford it.”). It’s the aural equivalent of the films such as Wall Street, Working Girl, Trading Places, Brewsters Millions and Secret of My Success. I can almost see the braces, filofaxes, shoulder pads and red rimmed specs every time I hear this record. Alongside Sledgehammer this is the other thumping, high tempo, overtly eighties style production on Peter Gabriel’s hugely successful So and the third single to be taken from the album (the wonderful Don’t Give Up preceded it). To many ears, Big Time hasn’t dated well but I disagree. I love the sound of the fretless bass, which was achieved by one musician fretting the notes while another hit the strings with drumsticks. Another highlight is the funky whacky-wah guitar (well you describe it then!) which gives it an almost seedy feel. The whole song sounds like a competition between the session musicians to see who can get heard the most. When you look at the list of contributors (Stewart Copeland, Producer Daniel Lanois, Tony Levin, PP Arnold on backing vocals) it’s a hell of contest. Not to be outdone by Sledghammer, the video for Big Time is another stop motion spectacular with a very similar visual style, albeit far more literal, to its predecessor. It’s fair to say that without Sledgehammer’s MTV (or in my case Chart Show) friendly video, So would never have reached the audience it did. My copy is (of course) the 12″ version, which has the standard extended mix on side A that is par for the course for the 1980’s, i.e. extend the intro, extend the middle eight, inclusion of the still-a-novelty-somehow n-n-n-n-ninetneen style vocal (“big big big ti-i-i-i-i-me”), etc. 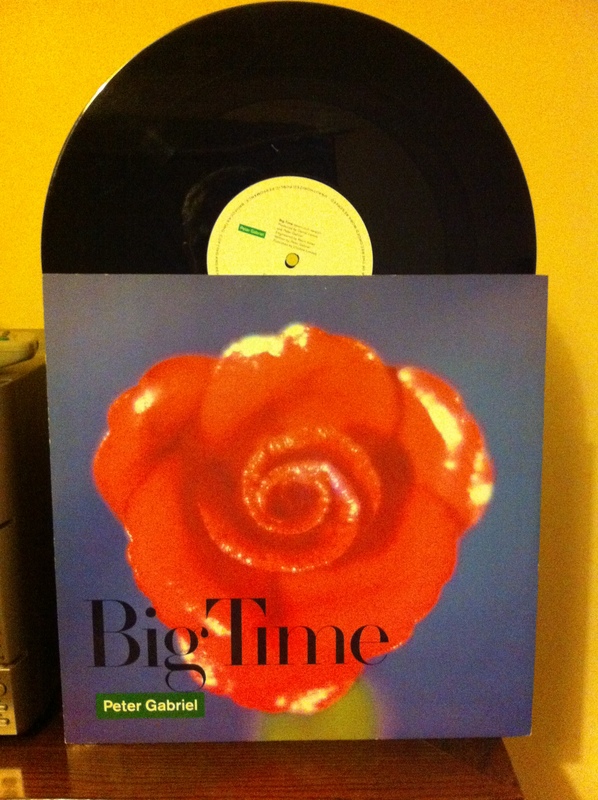 Big Time was followed by two further singles from So. In Your Eyes will be familiar to anyone who has seen Cameron Crowe’s fantastic teen rom-com Say Anything, while the distinctively radio-unfriendly but haunting Red Rain tackled acid rain, nuclear fall-out or weird dreams depending on how you interpret it. Neither were to repeat the success of their predecessors.